The path to a healthy body and happy belly is paved with real food—fresh, wholesome, sustainable food—and it doesn’t need to be so difficult. No one knows this more than Kathryne Taylor of America’s most popular vegetarian food blog, Cookie + Kate. 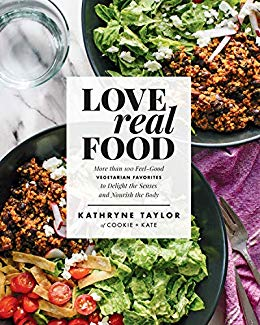 With Love Real Food, she offers over 100 approachable and outrageously delicious meatless recipes complete with substitutions to make meals special diet–friendly (gluten-free, dairy-free, and egg-free) whenever possible. Her book is designed to show everyone—vegetarians, vegans, and meat-eaters alike—how to eat well and feel well. With brand-new, creative recipes, Taylor inspires you to step into the kitchen and cook wholesome plant-based meals, again and again. She’ll change your mind about kale and quinoa, and show you how to make the best granola you’ve ever tasted. You’ll find make-your-own instant oatmeal mix and fluffy, naturally sweetened, whole-grain blueberry muffins; hearty green salads and warming soups; pineapple pico de gallo; healthier homemade pizzas; and even a few favorites from the blog. Of course, Love Real Food wouldn’t be complete without plenty of stories starring Taylor’s veggie-obsessed, rescue dog sous-chef, Cookie! Taylor celebrates whole foods by encouraging you not just to “eat this,” but to eat like this. Take it from her readers: you’ll love how you feel.